Brief Synopsis – An Oscar winning screenwriter in a slump gets a job across the country teaching screenwriting. My Take on it – This is a movie I heard about a while back, but never actually got the opportunity to seek it out and watch it until now. Earlier this week, I watched and reviewed Music & Lyrics (2007) and my biggest criticism of it was the fact that the pairing of the lead characters didn’t work as well as it should have because of the age difference between Hugh Grant and Drew Barrymore. 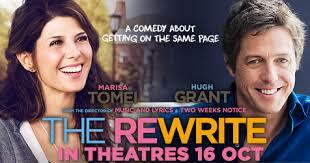 This movie, on the other hand works mainly because of the great chemistry between Grant and his co-star Marisa Tomei. Since they are much closer in age to one another, it feels more natural for them to star together. I am someone who likes movies a bit [yeah right, :)] and loved how many movie references were embedded here because of the storyline and it really was a gold mine of references and I really enjoyed waiting for them all to appear. The story itself is actually quite generic, but they chose to do some things in a way that made it feel fresher and enjoyable that it doesn’t matter as much that we know what will predictably happen. This movie also sports a great supporting cast with J.K. Simmons, Chris Elliot, Allison Janney helping to make this movie feel fun and more enjoyable. Bottom Line – The chemistry between Grant and Tomei works quite well and I’m glad to see Grant with someone closer to his age. The movie is filled with great movie references and is a goldmine for movie lovers like me. The story itself feel pretty generic, but the way it’s told comes off fresh and enjoyable despite the predictability and generic aspects of it all. Great supporting cast helps out too. Recommended! As far as pure enjoyment this is one of my favorites of 2015. It is so rare we get good romcoms these days and I love the genre. I thought the cast was really fun and writing reminded me of Nora Ephron. I liked the commentary on movies, writing, reading, teaching etc. I feel it is underrated from 2015.